acrylic on primed plaster walls, 9x60 ft, M Bender Residence, Washington, DC. Inspired by 18th century mural painting, the mural extends across all the walls and ceiling and includes a grape arbor and water garden. 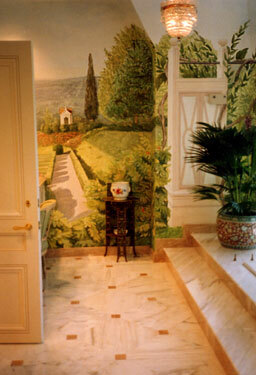 Murals like this one come together through a careful process of planning and client approval. Read about the steps to creating a mural and learn how you can get your own! Initial drawing. Theme and composition emerge through conversations with the client. Drawing on this vision, we create small black and white scale sketches, moving the concept toward a final full-color scale drawing. Final drawing approval. Once all the elements are agreed upon, a final drawing is produced for the client. The final drawing is a full-color scale study that will be used to produce the mural. Painting. This begins with a transfer of the color drawing to the surface of the canvas or tile. Initial viewing. Once a rough composition, color scheme, and details are painted, the client is invited to the studio. At this stage, the client can propose any adjustments. Studio visits are welcomed, but we can also ship professional photographs to our out-of-town clients. Final viewing. Before the last brushstroke is applied, the client is invited for a final viewing. At this stage, the mural is considered complete. Installation. The mural is then packed and shipped to out-of-area clients, who will probably find it most cost efficient and timely to engage a professional wallpaper (or tile) company for installation. However, we do offer professional installation as an optional service at additional cost. Payment schedule: The project begins with a signed contract and an initial deposit of 10% of the project’s total cost. A further deposit of 50% is due after the final drawing approval, and the balance after the final viewing. We’re pleased to offer up-front estimates. Simply contact us by phone or e-mail.